Record Store Day (RSD) was yesterday (April) all over the world, and it has indeed cemented its place. I remember its first year and it was nothing like in to what it has morphed. Good or bad, it always makes for a hot stove topic. Who does it benefit? Is it more for the record store proprietor? Or the record buyer? Perhaps both? Either way, even for one day, it does shine a light on record stores and lets the uninitiated know that they do exist in their neighborhoods. In some locales there are, much like with the pubs, Record Store Crawls, where over the course of day record buyers are encouraged to visit each and every independent record shop taking part. Yesterday was also the day of a record fair in my present locale, which has been going strong for 40 years now. This particular Record and Memorabilia Show as the show runners like to put it, takes place four times a year. As it is scheduled far in advance, they could not know that yesterday’s incarnation would coincide with RSD, which has become a moving target of sorts. Not wanting to deal with the insanely early hours and long lines/queues at the record shops, I attended the fair and was not disappointed in the least. Speaking with the show runners, who I will be interviewing later this year for an article I’l be writing, and drinking coffee with attendees, I was reminded of all the different reasons people, that includes us, have for not only listening but getting out there on such occasions to communally dig for records and share war stories. I am internationalist with multiple citizenships, traveling all over the world. That a show in America’s midwest, buffered by hours of travel from both coasts, would have not one, but two totally unrelated seminal albums in my life, stopped me in my tracks. 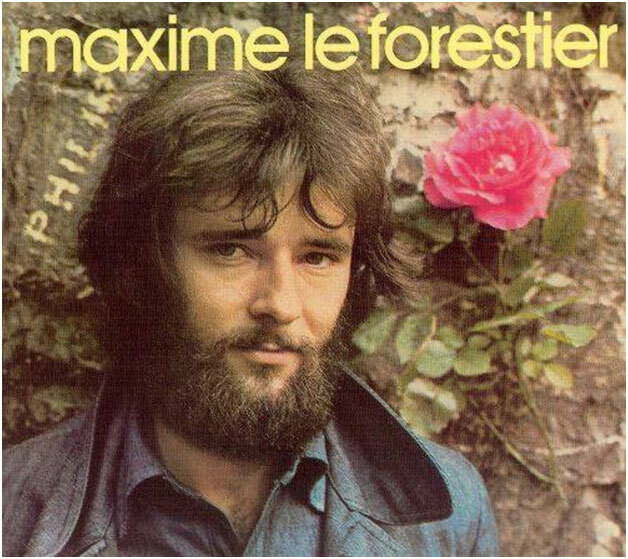 The first was an album entitled Mon Frère recorded by France’s version of James Taylor, Maxime Le Forestier. I was first introduced to this record by the daughters of a family who hosted me for the summer. It was so much fun being 12 years old, the only boy in the house, listening to records, learning how to roll cigarettes with tabac and getting lost in the music, the cigs, and the girls. The title song Mon Frère and second track Education Sentimentale have stayed with me all these years, but seeing the album in a $2 bin brought back all those memories and had me humming the tunes for a good while. A scant 5 minutes later, at another stall on the opposite side of the room, I was flipping through customarily uncategorized albums, when a recording of Beethoven’s 9th Symphony for two pianos struck me cold. While two piano, four hands transcriptions are uncommon, they are not peacock egg rare, but the pianists on this album were none other than the Contiguglia Brothers, identical twins who both graduated from Yale’s School of Music and went on to train under Dame Myra Hess in London. That they are identical twins, that they are both concert level pianists, that they both attended Yale undergraduate/graduate receiving the same exact GPAs upon graduation, is something, but there’s more to this story. 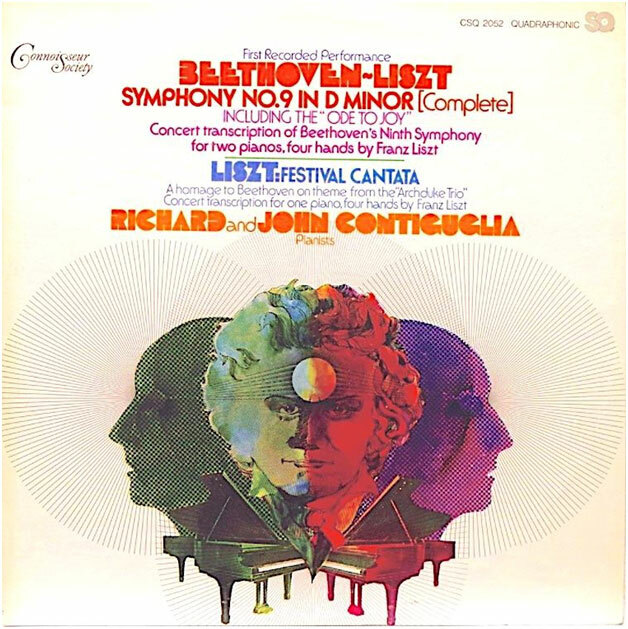 In an attempt to learn to play the piano, by a bizarre set of circumstances, prompted by attempts to track down this very album, I not only got the opportunity to meet Richard and John Contiguglia in person, but in exchange for my computer skills, I was to receive piano lessons from Richard. To not only see the album, but open it up to see photographs, took me back to the Ansonia apartment building on Manhattan’s upper West Side. It is said that more musicians per capita live in that one building than any other. Richard joked with me that there were/are more Steinway pianos in the Ansonia than all the rest of New York City. To this day I’m not sure that he wasn’t kidding. I could have gone to RSD, waited in line for records that I would probably enjoy and perhaps made new memories, but the record fair brought me back home, Full Circle.